New Home Sales slowed into the New Year but the market for newly-built homes remains strong. For home buyers in California and nationwide, December’s New Home Sales report is yet one more signal that the housing market recovery may be underway. Economists believe that a 6.0-month supply defines a market in balance — anything quicker is termed a “seller’s market”. Statistics like that are enough to create urgency among today’s Rancho Santa Margarita home buyers. Mortgage markets improved last week as news from the Federal Reserve, the U.S. economy, and Europe combined to spur new demand for mortgage-backed bonds. Conforming mortgage rates rallied from Wednesday through Friday’s close, ending the week near all-time lows set earlier this year. Last week’s rally was sparked by the Federal Open Market Committee. After its first meeting of the year, Chairman Ben Bernanke & Co. changed its projection for “exceptionally low rates” to at least late-2014. 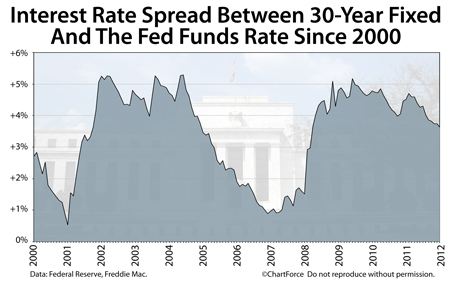 Previously, the Fed had said its benchmark Fed Funds Rate would remain low until 2013. This, in conjunction with the Fed’s message that further economic stimulus may be coming, led Wall Street investors to increase their bets on mortgage bonds, pushing up prices and pushing down yields. Lower yields means lower rates. Mortgage rates were also helped lower by mixed data on the U.S. economy including weaker-than-expected housing reports, and another setback in the Greece sovereign debt negotiations. Each time that Eurozone leaders have failed to reach an expected accord with Greece since 2010, mortgage rates have dropped. Last week was no different. This week, with a large amount of U.S. economic data due for release and a high-profile summit among European Union leaders, mortgage rates are poised to move. Unfortunately, we can’t know in which direction. 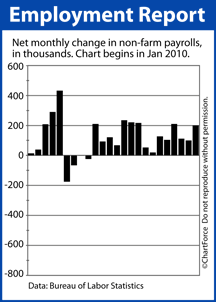 Of all of the economic releases, Friday’s Non-Farm Payrolls has the most potential to move markets. More commonly called “the jobs report”, Non-Farm Payrolls details the monthly change in national employment and the national Unemployment Rate. Jobs are believed to be the key to U.S. economic recovery so strength in jobs should result in higher mortgage rates throughout California and the country. Mortgage rates remain very low. If you’re nervous about mortgage rates rising this week or next, it’s as good of a time as any to lock your rate with a lender, and start moving toward closing. For today’s Rancho Santa Margarita home buyers and sellers, therefore, it’s important to understand your local market and the drivers of local activity. Reports like the Pending Home Sales Index can paint a broad picture U.S. housing but for data that matters to you, you’ll want to look local. Immediately following the FOMC’s statement, mortgage markets rallied, pressuring mortgage rates to fall in and around Trabuco Canyon. Mortgage rates remain near all-time lows and, for homeowners willing to pay points plus closing costs, conventional, 30-year fixed rate mortgages can be locked at below 4 percent. If you’re in the process of buying or refinancing a home in California , it’s a good time to lock a mortgage rate with your lender. For home buyers and would-be refinancing households in Trabuco Canyon , it’s important to recognize that the Fed Funds Rate is an interest rate separate and distinct from “mortgage rates”. Mortgage rates are not voted upon by the Federal Reserve. Rather, mortgage rates are based on the price of mortgage-backed bonds, a security bought and sold among investors. Historically, there is little correlation between the Fed Funds Rates and 30-year fixed rate mortgage rates throughout California. Going back 20 years, the benchmark rates have been separated by as much as 5.29% and have been as near as 0.52%. 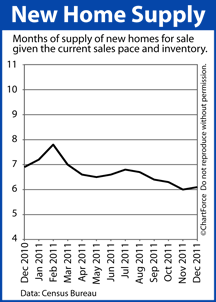 For today’s home buyer in Trabuco Canyon , December’s Existing Home Sales figures may be construed as a “buy signal”. Home supplies are dropping and buyer demand is rising. This is the basic recipe for higher home prices ahead. If your 2012 plans call for buying a home, consider that home values throughout California are expected to rise as the year progresses. The best values of the year may be the ones secured this winter. The outlook for the U.S. economy improved last week, taking the mortgage bond market with it. For the first time this year, conforming mortgage rates rose throughout California from one week to the next. Data was strong across all categories last week. In addition, European leaders moved closer to a final resolution on the Greek sovereign debt default situation. Overall, the action gave investors reason for optimism in the U.S. economy, and economies abroad. This drew money away from the U.S. mortgage bond market, which caused mortgage rates to rise. Freddie Mac reports the average 30-year fixed rate mortgage slipping 0.01 percentage points to 3.88% nationwide, with an accompanying 0.8 discount points and complete set of closing costs. These costs are slightly higher as compared to the week prior. 1 discount point is equal to one percent of the borrowed loan size. Freddie Mac’s weekly mortgage rate survey puts the conforming 30-year fixed rate mortgage under 4 percent for 7 consecutive weeks. 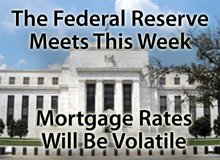 This week, mortgage rates may rise; the week is anchored by a 2-day Federal Open Market Committee meeting. Whenever the FOMC meets, mortgage rates can be volatile. The Ben Bernanke-led FOMC is not expected to raise the Fed Funds Rate from its current target range near 0.000 percent, but it’s not what the Fed does that can change mortgage rates as much as it is what the Fed says. 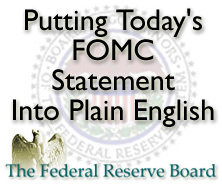 After its 2-day meeting concludes Wednesday, the FOMC will issue its customary statement to the markets, to be followed by a press conference led by Chairman Bernanke. Wall Street will watch the press release and conference for clues about the Fed’s next steps and its outlook for the U.S. economy. If the Fed indicates that the economy is growing, mortgage rates in Coto de Caza are likely to rise. Conversely, if the Fed indicates that the economy is slowing, mortgage rates are likely to fall. Other factors influencing mortgage rates this week include the President’s annual State of the Union address (Tuesday), the Pending Home Sales Index (Wednesday) and New Homes Sales data for December (Thursday). Mortgage rates remain low but may not stay that way. If you’re looking for the best rates of the year, this week may be your chance. When it comes to housing data, sometimes you have to look past the headlines. December’s Housing Starts data offers a terrific illustration of why. 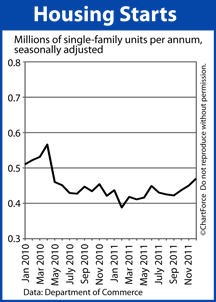 Each month, the Census Bureau tallies Housing Starts for the month prior. A “housing start” is a home on which construction has started. The Housing Starts report is separated by property type. There is a count for single-family homes; a count for 2-4 unit homes; and a count for buildings of 5 units or more, a category including apartments and condominiums. Now, although these headlines are factually true, they’re also are a little bit misleading. Housing Starts did fall 4 percent last month but that was for all Housing Starts, across all three property types. Data like this is somewhat irrelevant to home buyers in California or anywhere else nationwide. Few buyers purchase 2-4 unit homes, and almost nobody purchases an entire apartment building. Rather, it’s the Housing Starts reports’ “single-family” tally that matters because that’s the home type that the majority of home buyers purchase. In December, for the fourth straight month, Single-Family Housing Starts increased. Single-family housing starts climbed 4 percent last month to 470,000 units on a seasonally-adjusted, annualized basis. This is the highest number of Single-Family Housing Starts since April 2010 — the last month of last year’s home buyer tax credit. The Single-Family Housing Starts data is the latest in a series of data that point to a housing rebound nationwide. New Home Sales, Existing Home Sales, Pending Home Sales and Homebuilder Confidence has each posted multi-month highs and all are poised for strong gains into 2012. If you’re planning to buy a home in 2012, consider buying in between now and March rather than at some point later. Home prices — and mortgage rates- are likely to move higher. For the fourth straight month, the National Association of Homebuilders reports an increase in its Housing Market Index. The index climbed 4 points to 25 this month — its second four-point gain since October. With home sales activity increasing across all four regions, the monthly HMI has now nearly doubled in value since June 2011. The HMI is now at a 55-month high. The Housing Market Index itself is a composite reading; the result of three home builder surveys sent by the National Association of Homebuilders to its members monthly. Home builders report back on current single-family home sales volume; projected single-family home sales volume for the next 6 months; and current buyer “foot traffic”. The NAHB then results compiles the surveys into a single reading. 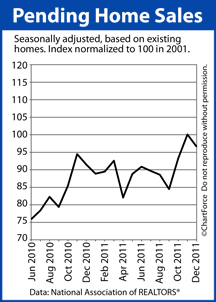 The Housing Market Index corroborates recent U.S. government data that suggests housing is mending in California. Both Housing Starts and New Home Sales have out-performed expectations of late, it’s been shown, and the stock of new homes for sale nationwide is dwindling. All of this, of course, is happening as demand from buyers heats up. Foot traffic through builder homes is higher than it’s been in more than 3 years, say the builders — a time period that includes the duration of the 2010 home buyer tax credit. 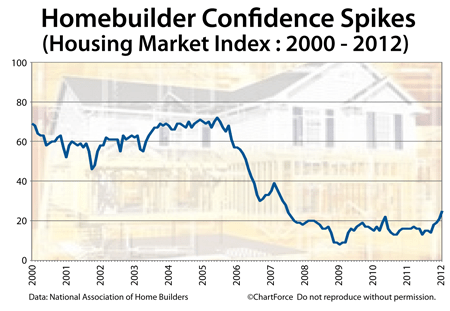 It’s no surprise, therefore, that builders expect a strong 2012. Jobs data is improving, mortgage rates remain low, and housing momentum is building. For home buyers in Coto de Caza , however, it may spell higher home prices ahead. Big demand and small supply creates scarcity and scarcity correlates to rising prices. If you’re shopping new homes, the best “deal” may be the one you find today. Foreclosure filings are fewer these days, according to foreclosure-tracking firm RealtyTrac. In December 2011, the number of foreclosure filings nationwide fell 9 percent from the month prior. Not since November 2007 has foreclosure activity been this sparse across the country. The drop does not appear to be seasonal, either. Last month’s foreclosure filings were down 20 percent from December 2010 with “foreclosure filing” defined to include any one of the following foreclosure-related events : (1) The serving of a default notice, (2) A scheduled home auction, or (3) A bank repossession. As a result of a unexpectedly strong year-end, 2011’s annual foreclosure rate was the lowest in 4 years. One reason why the year may have closed so strongly is that Nevada, California, Michigan and Arizona — four states typically associated with high rates of foreclosures — each posted big drops in foreclosure filings between November and December, plus double-digit drops between December 2010 and December 2011. 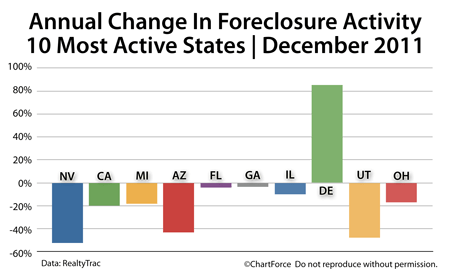 In fact, among the country’s top 10 states for foreclosure activity, nine showed an annual foreclosure filing reduction. It’s also noteworthy that just 4 states accounted for half of last month’s total foreclosure filings. Foreclosures are heavily concentrated, in other words. By contrast, the last 1% of activity is spread across 14 states. As a Trabuco Canyon home buyer — first-timer or investor — foreclosures can be a great way to find value. According to the National Association of REALTORS®, distressed homes typically sell at “deep discounts” as compared to like, non-distressed homes. However, when you buy a foreclosure home from a bank, it’s different from buying a home from a “person”. Purchase contract negotiations are different and months may pass before your closing is approved. If you’re buying foreclosure, therefore, seek the help of a professional real estate agent. Real estate agents have experience working in the process-heavy world of foreclosures and can help you come out ahead.